Adopting a regular exercise routine can provide seniors with mental and physical benefits that boost their overall health. Seniors can start off with easy exercises, and once they build their strength and endurance they can incorporate more challenging activities. The objective is to keep the body in good shape and enhance cognitive health. Here are some of the reasons family caregivers should encourage their senior loved ones to exercise regularly. Aging causes bone health to decrease, leading to balance and flexibility issues, which can make it difficult to walk. However, engaging in regular exercise can strengthen muscles, which reduces the risk of falls. Dancing and jogging are good exercises to do in the senior years. Exercising on a regular basis can also reduce the risk of a hip fracture, joint pain, or age-related conditions such as osteoporosis. There are a variety of age-related health conditions that can make it more challenging for seniors to live independently. However, many of the challenges they face can be easier to manage if their families opt for professional elder care. Montgomery families can rely on expertly trained caregivers to keep their loved ones safe and comfortable while aging in place. Diabetes can cause other health issues, including dementia and infections. The more your loved one exercises, the lower his or her risk of developing diabetes will be. Exercising regularly can keep blood glucose levels down. When blood sugar is controlled, the body can use insulin better. 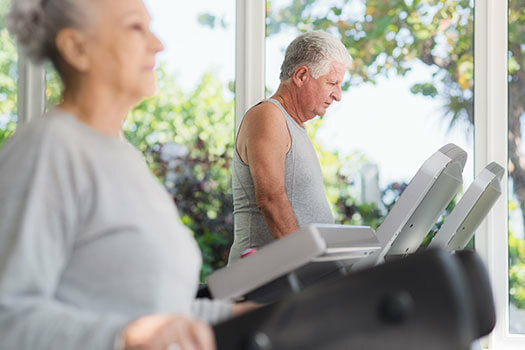 Working out can return blood glucose levels to a normal range, which helps seniors with prediabetes prevent diabetes. If your loved one requires help maintaining a regular exercise routine, consider hiring a professional caregiver. In Montgomery, home care agencies can be a great boon to seniors. With the help of the caregivers at Home Care Assistance, your aging loved one can lead a happier and healthier life. We offer a revolutionary program called the Balanced Care Method, which encourages seniors to eat nutritious foods, exercise and socialize regularly, and focus on other lifestyle factors that increase life expectancy. Exercise can enhance your loved one’s emotional wellbeing and help him or her manage negative emotions and stress. When dancing or swimming, the body produces positive endorphins that fight against the stress hormone known as cortisol. The endorphins may begin enhancing your loved one’s mood almost instantly. Instead of feeling depressed and sad, he or she may feel energized, happier, and full of confidence. Confidence can lead to better socialization skills and reduce the risk of isolation. If your loved one is more confident, his or her odds of being afraid may decrease. Fear can cause seniors to doubt themselves when it comes to accomplishing everyday activities such as walking and cooking. Some seniors prefer to exercise at home, and they can enjoy a higher quality of life with the help of professional in-home caregivers. Aging in place can present a few unique challenges for older adults. Some only require part-time assistance with exercise or meal preparation, while others are living with serious illnesses and benefit more significantly from receiving 24-hour care. Montgomery Home Care Assistance are leaders in the elderly in-home care industry for good reason. We tailor our care plans based on each senior’s individual needs, our caregivers continue to receive updated training in senior care as new developments arise, and we also offer comprehensive care for seniors with Alzheimer’s, dementia, and Parkinson’s. To schedule a free in-home consultation with one of our friendly Care Managers, call (334) 593-3988 today. Does Forgetting Words Signify Alzheimer’s? What Advantages Do Caregiver Support Groups Offer?